As we have told you last week that Apple may be start shipping newly introduced ThunderBolt Displays to your location, this week it is reported that Apple has finally begins the shipping process after the mysterious launch of Firmware updates which fixes the compatibility of the MacBook Pros with new Cinema Displays. 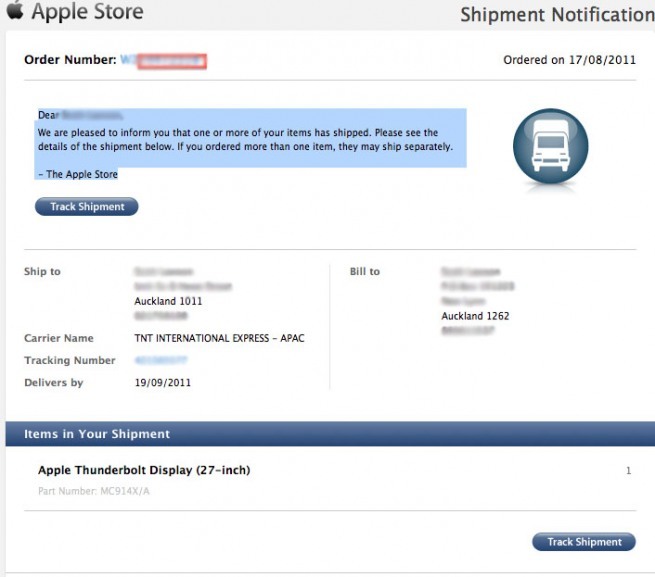 One of the 9to5mac reader has just tipped them a picture of his order slip and revealed that Apple has finally throwing its ThunderBolt displays to the locations. According to the purported image which shows that he ordered his ThunderBolt display on August 17 and now was in the way to his location for shipping. As noted by the folks over 9to5mac, these displays are not directly shipping from China to customers location, instead of it they are shipping the Displays from the holding spot in Australia, which also suggests that the delay in the shipping of these displays was not for any hardware glitch, it was for the software update, which Apple has released last night.